Previously, I was talked about researching the right keyword, using the Google Adword Keyword tool and how to go about it right. The truth is Keyword research is not something you can learn in a day or two. Frankly, I'm still learning new things about it myself. One of the beauties(or annoyance, depending on how you look at it) of SEO is the fact that it's always changing! One day your ranking no 1 for a particular keyword and then suddenly you find yourself on the fifth page of the search results and you sit there thinking what did I do wrong? Trust me, there are so many scenarios for that answer! But I digress, so back to Google Webmaster and Analytics. Remember I will only be talking about these tool in relation to keyword research or else I won't be able to talk about these tools in just one post, believe me. In the end I will most likely have to spilt this post into two sections, lets see how it goes. So, you have a website or blog and you have content in it. Did I mention that when it comes to SEO "Content is King"? Its a very powerful phrase, always remember that, but then again, if you have a blog you already know this. I always suggest you install Google Webmaster Tools on your website, whether its a new site or an old one. The GWT is used for monitoring a website, including how fast it takes a crawler to go through your website, when your website was indexed last (or if it has been indexed at all), your main keywords (the koko for this post), suggestions on how to improve your web code, links to your website (don't take this seriously, I mainly use Open Site Explorer or Yahoo Site Explorer, but don't worry we'll go into SEO tools for link building later) and lots of other important things which I can't remember right now. Once you've installed GWT by adding a verification code on your web server or to your HTML code it will take some time for you to actually get any tracking statistics for your website, a day or two, if its an old site. However, new sites take a little longer to get noticed by Search engines, especially if you haven't done much link building for your website. Once you've got the basic statistics for your website then we are good to go for keyword research. 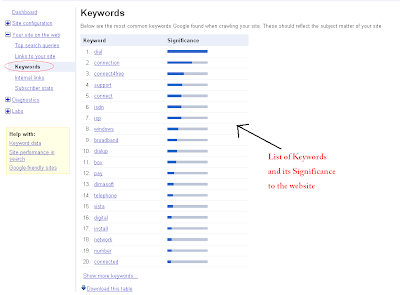 The GWT has a Keyword Density section for checking your website keywords against it's significance. 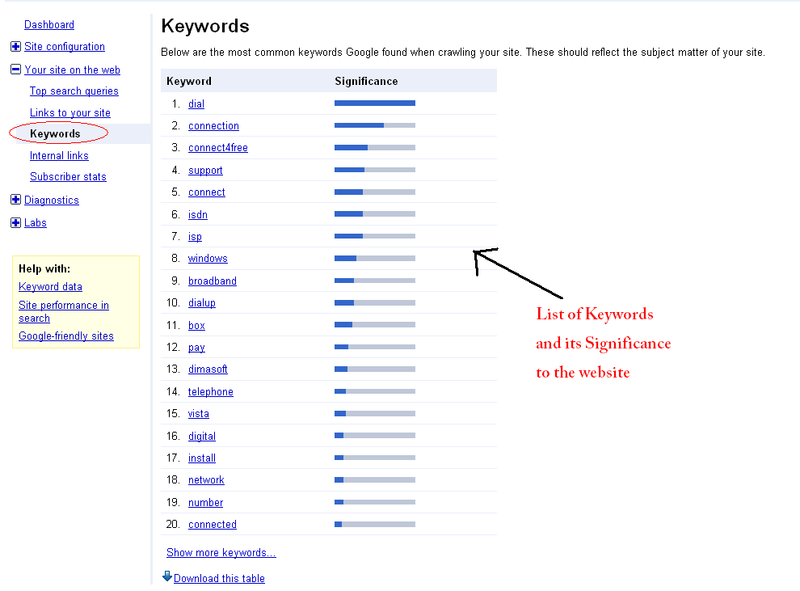 It checks the ratio of the keyword frequency to the rest of the content on site. Its one of the ways Google tries to ensure relevant results when you perform a search with them. In other words if you search for Tola Famakinwa, you will find things related to me, including this website and not someone else because my name is all over the website. So think about that when you are choosing a keyword and writing the content. There is no way you going to be found by search engines for something which has little or no keyword density on your site or blog. This is a screen shot of GWT Keyword section and the website has more to do with ISDN Dial up, although the most important word is 'dial' and 'connection'. Another similar tool I use to check keyword density is David Naylor's Keyword Density tool, it does pretty much the same thing as GWT with some added information too. I initially planned on including Google Analytics Keyword research to this blog but it was looking scarily long so decided to make that the final part of my series on basic keyword researching tools. Honestly didn't know there was that much to write on. I'll post that in the next few days so hang around for the final section of that. Update: Since Google has so kindly updated their Webmaster Tool I've had to update my screen shoots. So here's the Google Webmaster Tool Updated for Keyword research.